Boil water after adding color to it. Add the fired rava slowly to the boiling water. Keep mixing while adding rava to avoid forming lumps. When rava is cooked (ie, when the rava and water forms a solid proposition) add sugar to it with continuous stirring. You will see some rava lumps already. Don't panic. You can break them using the laddle by pressing on the lumps. Keep mixing. When it starts to solidify, add ghee little by little. Add elaichi powder. When the mixture does not stick to the sides of the pan, it is ready. Take a small frypan. Add 1 teaspoon of ghee. Add cashew to it. When cashew starts browning, add kismis. 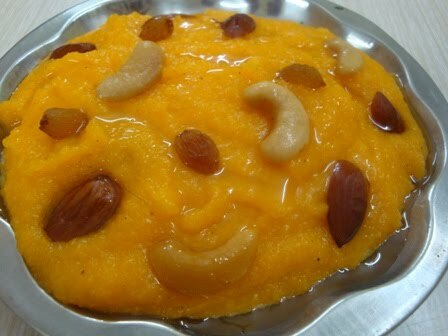 Add the fried cashew and kismis to the kesari and mix well.